EdR (NYSE: EDR), one of the nation's largest developers, owners and managers of high-quality collegiate housing communities, today announced it has started construction on a community pedestrian to Iowa State University in a joint venture with developer, River Caddis Development. Opus Design Build, L.L.C. is the design-builder and Opus AE Group, L.L.C. is the architect and structural engineer of record for the 320,000-square-foot mixed-use development. The community will add 537 pedestrian-to-campus beds in a mix of studio, one-, two-, three- and four-bedroom floor plans to the EdR portfolio. EdR will be 70 percent owner and manager of the $51.9 million development which is targeting a summer 2018 delivery. "Iowa State is a top-tier university that is experiencing steady growth," said EdR chief executive officer Randy Churchey. "With a pedestrian-to-campus location and outstanding amenity offering, this community will be another important asset in the EdR portfolio." Located on the corner of 2700 Lincoln Way, the 6-story project is designed to enhance the vitality of the site and the vision of the Campustown Revitalization by enriching the Lincoln Way, Sheldon Avenue and Hyland Avenue pedestrian experience and providing a gateway into Campustown. "This location is directly across the street from Iowa State University in the heart of downtown Ames, Iowa," said River Caddis president Kevin McGraw. "We have gone to great lengths to collaborate with the City of Ames to design an aesthetically pleasing, long-term sustainable development, and believe we have accomplished that goal. Teaming up with an industry leader, such as EdR, makes this project that much better and partnering with Opus has proven to be an excellent choice for us as they are very good at working together in a team effort." The project will feature 157 apartment units and 7,500 square feet of ground level retail space. The apartments will also feature luxury amenities including two outdoor resident amenity decks, an outdoor hot tub, club room, fitness center, study rooms, leasing lounge and residential parking. Additionally, residents will enjoy in-unit washers and dryers and WiFi throughout the community. "We're excited to design and build another best in class student housing option for the Iowa State area and to continue building off the success we've seen with other recent student housing project in the area," said Jeff Smith, vice president, Opus Design Build, L.L.C. 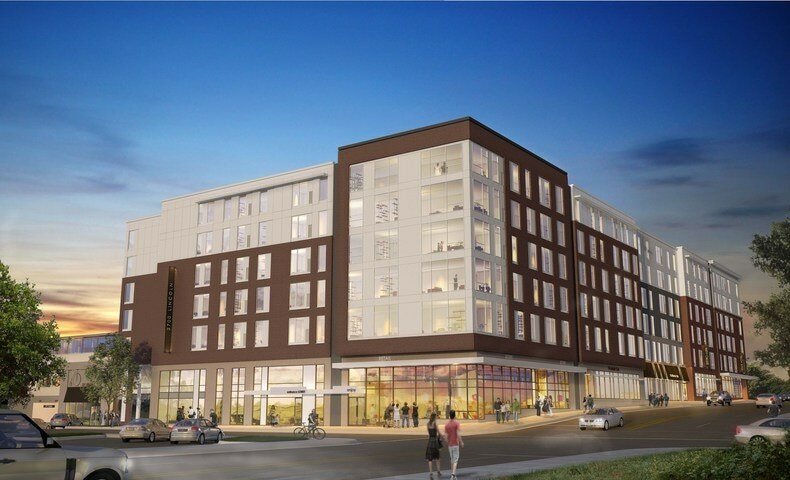 "Student housing continues to be in high demand in Ames, and we're pleased to be working with River Caddis and EdR to continue filling that need and add value to the surrounding community where this project will be a great fit." Founded in 1858, Iowa State University is a public flagship land-grant and space-grant university located in Ames, Iowa. It offers more than 100 undergraduate and nearly 200 graduate degree program in eight colleges. Iowa State's biological/agricultural engineering program is ranked best in the country with nearly all of ISU's engineering programs ranked in the top 30 in the U.S. Total enrollment in the Fall of 2016 was 36,660 and that enrollment has grown by more than 11,000 students since the start of the 2006 academic year.